Complimentary financial seminars provided to Andrews Federal membership and the local military community as part of the 2016 Military Saves Week. Andrews Federal and Joint Base Andrews staff after the Military Saves Week Proclamation signing. Andrews Federal Credit Union recently wrapped up a week full of complimentary financial seminars provided to its membership and the local military community, as part of the 2016 Military Saves Week. Military Saves Week is an annual opportunity for installations and organizations to promote good savings behavior, as well as a chance for service members and their families to assess their own saving status. Typically hundreds of organizations participate in the week, reaching millions of people. 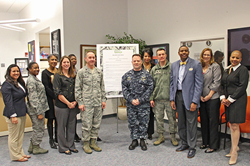 Andrews Federal kicked off the weeklong activities by participating in the Military Saves Proclamation Signing held at the Joint Base Andrews Military & Family Support Center. Oma George, Chief Retail Officer, Polly Quinn, Director of Marketing and Rosalind Bishop, Regional Manager DC, MD, VA, witnessed the signing of the Proclamation by Col. Bradley Hoagland, Joint Base Andrews Commander and Capt. Scott Fuller, Commanding Officer, NAF Washington. The Credit Union then hosted a series of free seminars aimed at providing members of the military community and their family with financial tips for saving money, buying a home, and purchasing or refinancing a vehicle. On Monday, nationally syndicated Washington Post columnist Michelle Singletary shared personal finance tips with a crowd gathered at Andrews Federal Headquarters in Suitland, MD. The event was also available via webcast to additional attendees. On Tuesday, Andrews Federal and Joint Base Andrews Military & Family Support Center staff began a series of free financial seminars to educate the military community and their family members. Lindsay Ruehl, Community Outreach Coordinator and Polly Quinn teamed up to encourage students at Imagine Andrews Charter School and the Youth Center at Joint Base Andrews, to begin investing in their future now by saving. Stan Koussis, Community Development Manager, presented an auto buying seminar; providing valuable information and resources to help individuals with the auto buying process, and Edith Jenkins conducted two home buying seminars. Andrews Federal Credit Union was founded in 1948 to serve the needs of military and civilian personnel by providing a vast array of financial products and services. With over $1 billion in assets, Andrews Federal has grown to serve more than 116,000 members in the District of Columbia, Joint Base Andrews (MD), Springfield, Virginia (VA), Joint Base McGuire-Dix-Lakehurst (NJ), and military installations in central Germany, Belgium, and the Netherlands. In addition, the Credit Union serves as a financial partner with many select employee groups in Maryland, the District of Columbia, Virginia and New Jersey.